Red Cliff is a truly epic film (2.5 hours cut down from the original 4.5 hrs) by director John Woo. Interestingly, it was released in two parts within China, totalling 4.5 hrs in length, but the decision was taken to release a single film in the west. 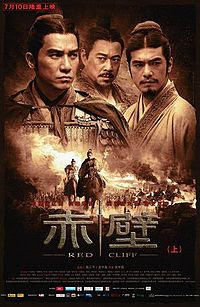 Set in 208 A.D., the film is based on the true events of the Battle of Red Cliffs, when Chancellor Cao Cao persuaded the emperor to let him lead an army to wipe out the lords of the southlands Sun Quan and Liu Bei. Fantastic warriors surround the two southern lords, who are fighting to protect their lands and homes. Some of these warriors even sport Chewbacca-like whiskers and beards. What you actually get is an epic film full of fight scenes, some dodgy CGI and a pace that just doesn't stop. Oh, and a strategist who can forecast the weather with deadly accuracy. Met Eireann could do with him at the moment. Battle scenes with military formations and hand-to-hand combat will leave you speechless, while the flight of a dove presents an amazing aerial view of the army camps. Charming and amusing characters provide a point of real interest in the film. In short, this is one classy blockbuster - an intellectual cut above the norm.